If you decide to format your SPSS output file as a web page, the output text will be formatted as HTML. Any pivot tables selected for output will be formatted as HTML tables, and any images to be output will be written to separate files in the image format of your choice. You can make a number of decisions about the details of the HTML file; they appear when you click the Change Options button for the document in the Export Output dialog box. The first options to set are the layers in pivot tables. Some pivot tables have more than two dimensions, and the other dimensions are presented as multiple displayable layers. By setting this option, you can include or exclude layers in the HTML file — if you have a multilayered table, you’ll probably have to experiment with this setting to get desirable results. A pivot table can have multiple headings and footnotes. You can choose to have the footnotes and headings included or excluded. The onscreen view is not the only one available. You have the option of including all views in the output or showing only the view that is currently visible. 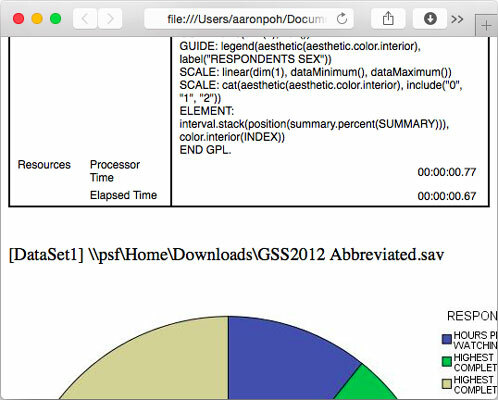 The figure shows part of the output page as it appears in a web browser — using the default settings for everything, including the JPEG image. SPSS output as a web page. Notice that the commands that generated the graphics were included and formatted in an HTML table. You may decide to leave that information out. You could, if you wanted, leave the table out and include only the graphic and its annotation. Also, if you were going to publish this as a web page, you’d probably want to edit the heading so it was something other than the name of a working directory on your local machine. In this example, the output filename is GSS2012Abbreviated, so the main file is GSS2012Abbreviated.htm and the image file is GSS2012Abbreviated.jpg. The .jpg suffix indicates that a JPEG image file was the chosen option. The digit in the image filename is necessary because there could be more than one; each needs a unique name.